Painting depicting the Juaneño Band of the Acjachemen Nation, Orange County's original owners and inhabitants, along the Santa Ana River. "California has a rich Native American heritage more than in any other state; there are hundreds of tribes calling California home. The native inhabitants of San Juan Capistrano and all of Orange County belong to the Acjachemen Nation...the Acjachemen (A-ha-sha-men) occupied the pristine coastline, vast valleys, and majestic mountains which stretch from Long Beach to Oceanside, as far east as Lake Elsinore, and westward to Catalina and San Clemente Islands. The Acjachemen possessed an intricate social structure based on clans. 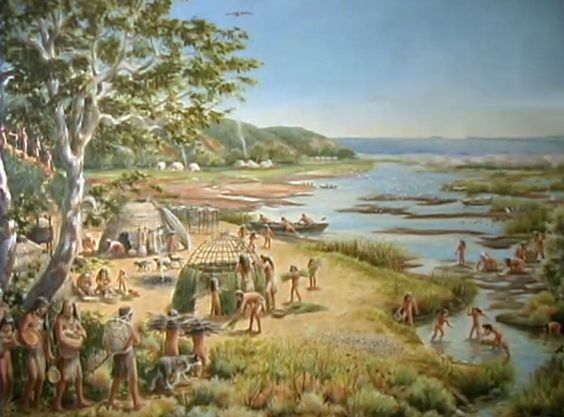 Villages were governed by male and female clan leaders called Nu and Coronne who oversaw hunting and gathering expeditions, migrations to seasonal settlements, tribal councils, and ceremonies. Villages contained populations of about 50 to 250 each. Both women and men wore grass skirts and animal skins; with elaborate jewelry made of shells, seeds, and beads. Within the village, Acjachemen families lived in Kiichas, domed-shaped huts made of willow and tule. The people ate wi-wish or acorn meal, fish, and roasted deer or rabbit meat. Hunting was performed with bow and arrows, snares, and throwing sticks. Stone bowls, grinding stones and tools were ingeniously made by the Acjachemen, as well as intricately woven baskets. The Acjachemen were a deeply spiritual people who celebrated their religion in sacred ceremonies of dance and song." ~ "Native American Village - San Juan Capistrano, California." 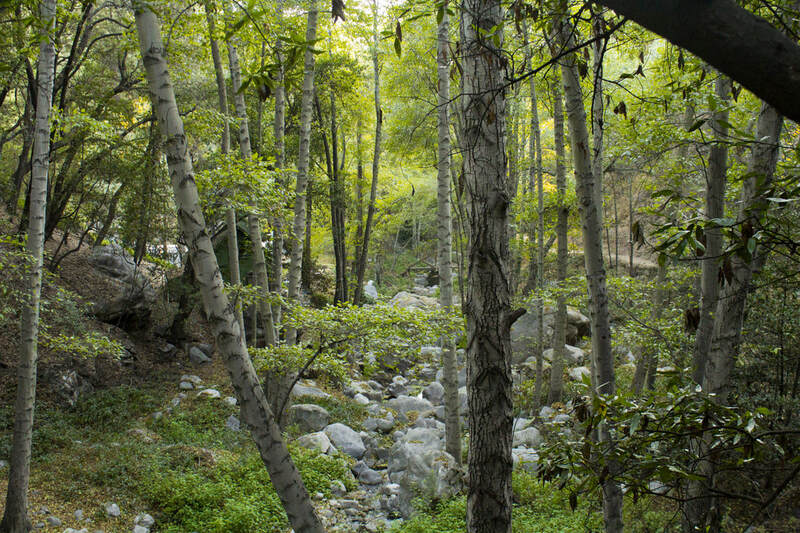 The first recorded baptisms in Alta California were performed on July 22, 1769 in "The Canyon of the Little Christians" in what today is southern Orange County. 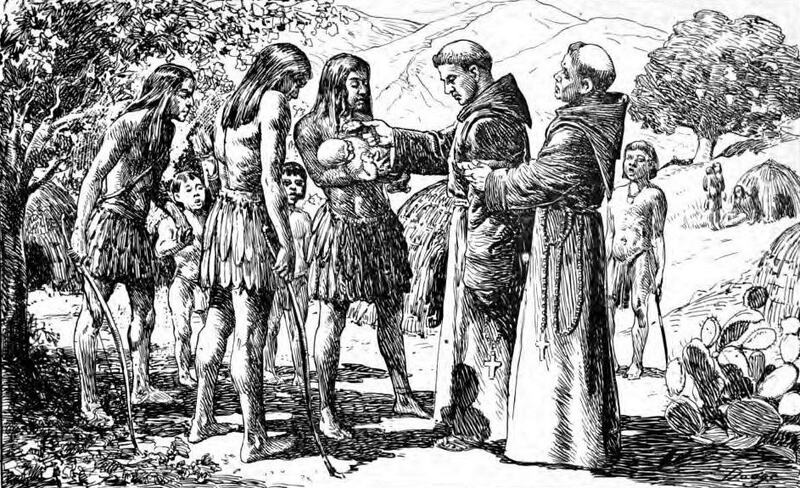 Taken from p. 285 of San Juan Capistrano Mission by Engelhardt, Zephyrin (1922). Arroyo Willow, a California native shrub/tree. Spanish exploration of California, during the Portolá Expedition, found a "beautiful river" with "many groves of willows," the bed of which "is well grown with sycamores, alders, willows, and other trees." (Portolá Expedition, July 28, 1769, Diaries). "On its right bank there is a populous village of Indians, who received us with great friendliness. Fifty-two of them came to the camp, and their chief told us by signs which we understood very well that we must come to live with them; that they would make houses for us, and provide us with food, such as antelope, hares, and seeds. They urged us to do this, telling us that all the land we saw, and there was certainly a great deal of it, was theirs, and that they would divide it with us." (Portolá Expedition, July 28, 1769, Diaries). Black Willow Tree, a California native tree. 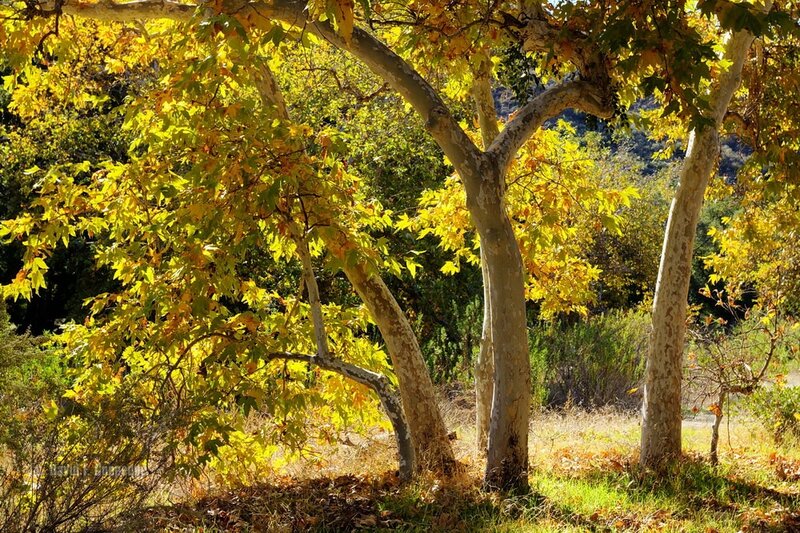 California Sycamore, a California native tree. Photo by Dave Coppedge. "Old Saddleback", formed by Santiago Peak and Modjeska Peak of the Santa Ana Mountains. 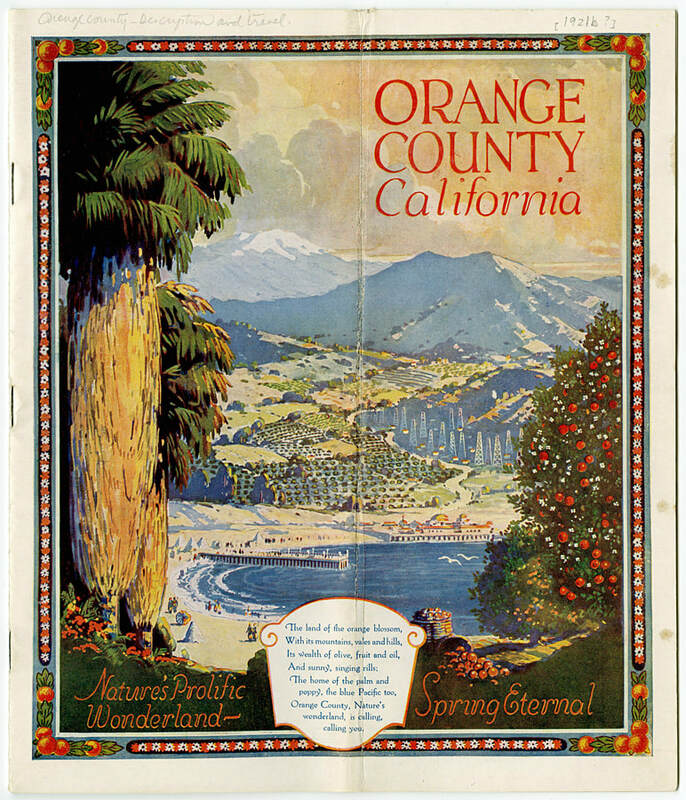 Image from UCI Library's Collection of Orange County historical documents. Fray Juan Crespi "called this place Nombre Dulce de Jesus de los Temblores (Sweet Name of Jesus of the Earthquakes), because we experienced here a horrifying earthquake, which was repeated four times during the day. The first, which was the most violent, happened at one in the afternoon and the last one about four." (Portolá Expedition, July 28, 1769, Diaries). "The name makes mention of the first recorded earthquake in Orange County. The military officers in the party subsequently changed the name to Santa Anna in honor of Saint Anne, which they had recently celebrated." 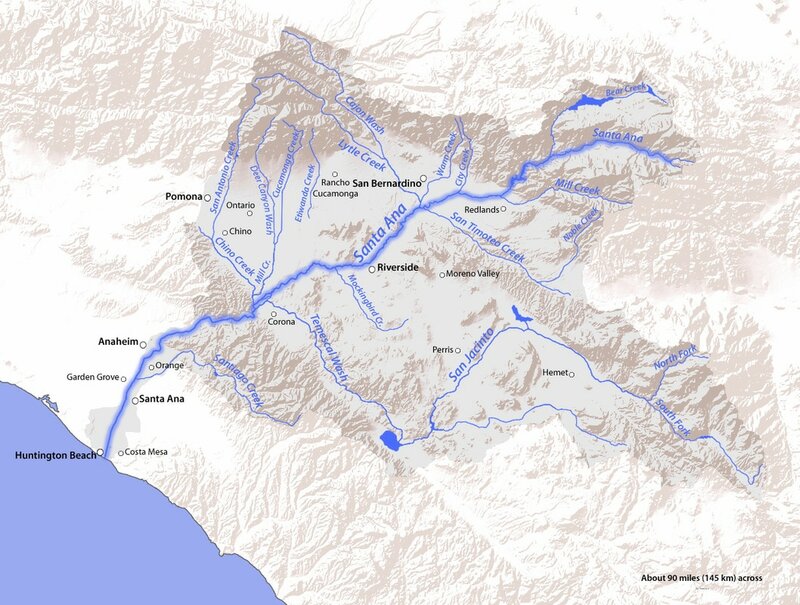 (Historical Timeline of the Santa Ana River). "Though the range is believed to have been first named by the Portolá Expedition, which camped at its base on Saint Anne's Day 1769, according to an 1801 map, the range we now know as the Sant Anas was divided into two ranges. The northern section was named the Sierra de Santiago, and the southern section was the Sierra de Trabuco. The highest peaks of the range, Santiago and Modjeska, seemed to be the dividing point. It was an 1860 map that first officially attributed the name Santa Ana to the range, calling the mountains the Sierra de Santa Ana. This map also appears to be the first official reference to "Old Saddleback," the name often given to the mountain and twin peaks of Santiago and Modjeska. Saddleback has also been known as Temescal Mountain and SanJuan Mountain at various times and by different communities." (Mitchell). Photo from Big Bear Valley Trails Foundation. "Santa Ana River TRAILHEAD. 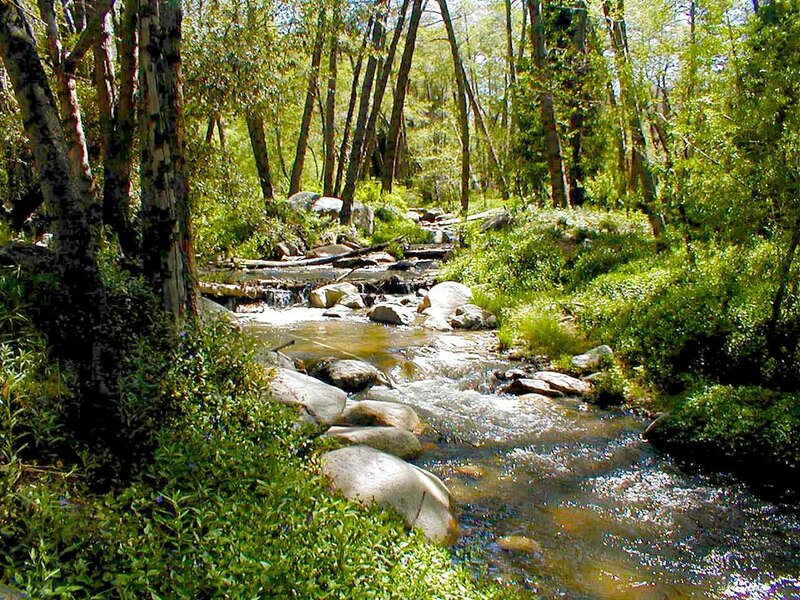 San Bernadino National Forest." ​ San Bernardino Mountains, at the confluence of two tiny right: Bear Creek, flowing southwest from well-known Big Bear Lake....the Santa Ana flows city of Riverside, it discharges into ormed by Prado Dam...After flowing our cuts a second Santa Ana Canyon, a water gap, betweennd the Puente Hills and Chino Hills, crossing into Orange County. 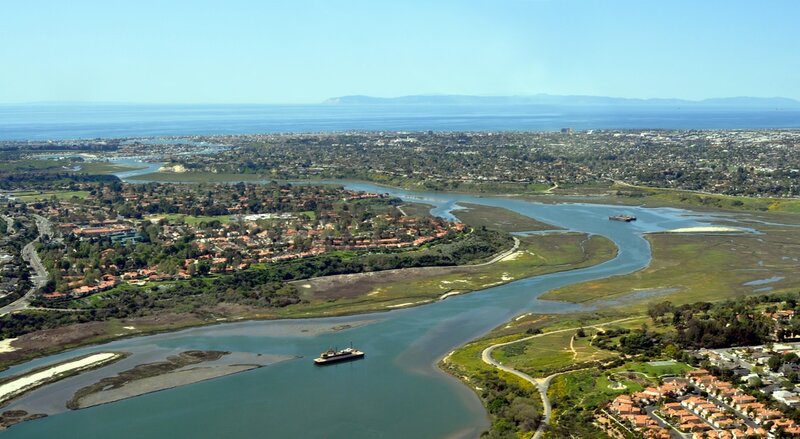 The original main outlet of the Santa Ana River, here the Newport Bay opening out to the Pacific Ocean with a view of Santa Catalina Island in the distance. Balboa Island (named after Vasco Nuñez de Balboa, the Spanish explorer who discovered the Pacific Ocean in 1513), began as piled-up silt from a Santa Ana River flood, was dredged and then further built up into an island by William S. Collins. ​"History of the Santa Ana River"
​"The Santa Ana River: How It Shaped Orange County"
"How California is Turning Drainage Canals Back to Rivers"
"The Santa Ana River is Ready for Its Renaissance"
​"Fly Fishing on the Santa Ana River, Angelus Oaks, CA"
"Rainbow Trout Fishing Santa Ana River Southern California"
​"Wild Pigs: Officials Seeking Okay for Hunt"
"Orange County History: Land! (1850-1900)"
"History of the Mission San Francisco de Asís (Mission Dolores)"
​"Taming the Santa Ana River..."
"History of Santa Ana River Flows to Orange County"
"Santa Ana River Was West's Greatest Flood Hazard"
The re-routed main outlet of the Santa Ana River to the Pacific Ocean. 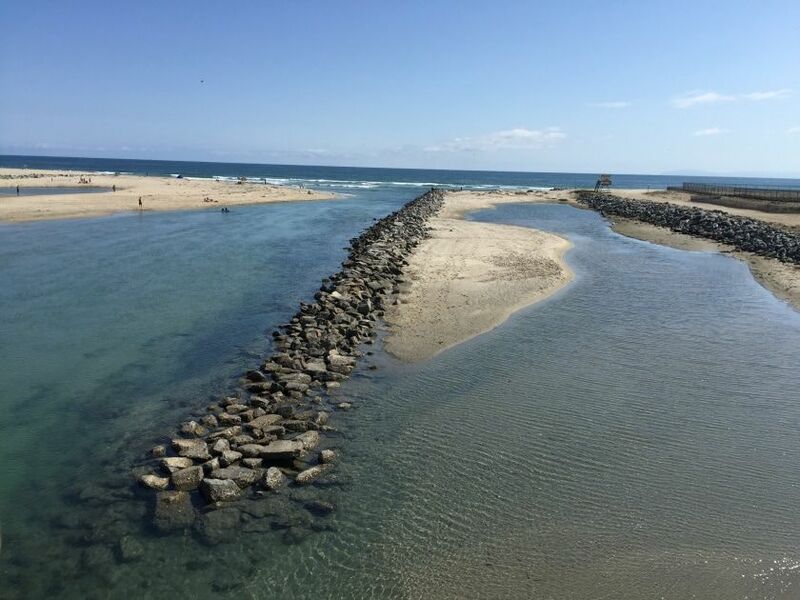 "Santa Ana River at Huntington Beach," July 2, 2015. Photo by Richard Bangert. Santa Ana River. Newport Beach on the left, Huntington Beach on the Right. Help Restore the Santa Ana River & the Santiago Creek! Various groups host river and creek clean-up days; join in and help make Riverview West a wonderful place to live! 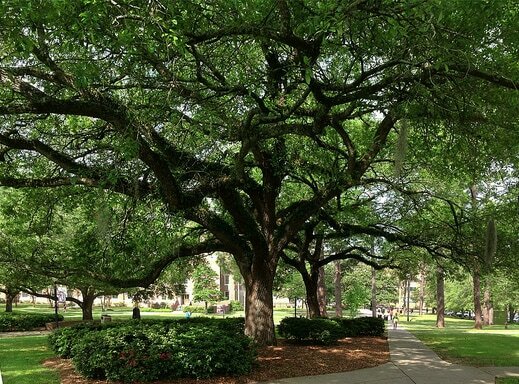 Live Oak Trees, California native trees. Miguel Costansó and Fray Juan Crespi named the Santa Ana River "El Río de Jesus de los Temblores" upon its discovery on July 28, 1769, but the soldiers called it the "Río de Santa Ana." No mention in the Portolá diaries about the "Santa Ana Mountains." "Sampler of Santa Ana Mountain Treats"
"Geographers to Take a Peek at Old Saddleback"
​"A Brief History of the Santa Ana Winds"
​"Santa Ana Mountains: History, Habitat, and Hikes"
"It was an 1860 map that first officially attributed the name Santa Ana to the range, calling the mountains the Sierra de Santa Ana." "The Largest Intact Natural Landscape Remaining in Coastal Southern California"
​"UCLA Explains the Naming of the Santa Ana Winds"